Delaney Bruce has kept vigil over the case of Leonard Peltier for 34 years. It is a long time to keep vigil over an individual and the issues surrounding a case. For Bruce, Peltier’s case is a matter of justice. Bruce’s ongoing enthusiasm sparked interest in the case for hundreds of supporters around the world to mark the June 26th anniversary of the Pine Ridge Reservation incident in plains southeast from the Badlands National Park in South Dakota. Bruce and many supporters awaited the outcome of the recent parole hearing for Peltier. The latest denial was a crushing defeat, but not one that would stop Bruce or her fellow supporters from continuing the fight to release Peltier. Time is not an obstacle for Bruce, though she is well aware that the deteriorating health of Peltier may be the greatest defeat. The circumstances surrounding the case of Peltier’s 1977 murder conviction for the deaths of two FBI agents have drawn years of criticism from a host of Native Americans, world leaders, celebrities and human rights advocates. The events during that early summer day began when two FBI Special Agents, Jack Coler and Ronald Williams, entered the Pine Ridge Indian Reservation. The reservation is home to the Oglala Lakota (Sioux) Tribe and extends to three counties along the South Dakota border with Nebraska. It is the eighth largest reservation in the U.S., and the poorest. Pine Ridge was established in 1889, nine years after the massacre of Wounded Knee. Pine Ridge did not achieve its own recognized government until 1936, though any representation outside its borders remains questionable. The region held more importance for the U.S. government with the discovery of gold. Pervasive poverty and unrest demoralized its residents until the early 1970s. Pine Ridge had been a monitored by local and federal law enforcement since 1972 when members organized as the American Indian Movement (AIM) to fight for rights and ownership of their land. In the early 1970s, AIM had been working to negotiate new laws concerning Native Americans. One of their objectives was to abolish the Bureau of Indian Affairs and replace it with an Office of Federal Indian Relations, in addition to restoring 110 million acres of land. The group presented their requests to President Nixon in late 1972 culminating from a march to Washington, D.C., called The Trail of Broken Treaties. Less than a year later, a 71-day standoff ignited between AIM members and the FBI on the reservation. Two FBI agents and two Lakota members died. Though a peaceful settlement was reached between the U.S. government and the tribe, hardship and violence continued inside the reservation. By 1975, the local and federal law enforcement regularly monitored the reservation, entering whenever there was cause. Tribe members inside the reservation considered it disrespectful of their sovereignty guaranteed by treaties. The 1973 Wounded Knee Incident did not end for many of the residents inside the reservation. U.S. policy only fueled a deeper distrust for residents who perceived the surveillance as harassment. AIM was now a national organization with members from dozens of tribes. During the weeks preceding the 1975 incident, AIM members around the country were invited to Pine Ridge to ease the fears of the local families. Peltier, Robert Robideau, Darelle Butler, Norman Charles and Michael Anderson were some of the members who accepted the invitation to Pine Ridge in June of 1975. On sunny June morning, FBI agents Coler and Williams entered Pine Ridge to search for a young man named Jimmy Eagle. The two agents wanted to question Eagle about a recent assault and robbery. They drove in separate vehicles armed with .38 pistols and shotguns. When the shooting first began, the FBI agents called for backup telling the dispatcher that they were overmatched in firepower. When the shooting ended, FBI agents Coler and Williams were dead, along with tribal member Joe Stuntz, whose death has never been resolved. By that afternoon, Peltier and the others fled in separate directions before the reservation was surrounded by local, state and federal law enforcement. A nationwide manhunt ensued for the men. Myrtle Poor Bear, who was listed as the witness, pointed to Peltier as the shooter, but she would later be considered incompetent to stand trial as a witness. Butler was the first of the alleged shooters arrested. Several days later Robideau, along with Charles and Anderson were found in Kansas and arrested. Peltier was stopped in Oregon by a state trooper, but after a several shots fired, escaped. The FBI states that Coler’s handgun was found in the RV in Oregon that Peltier was driving. The FBI placed Peltier on the agency’s “Most Wanted List.” Peltier was captured in Hinton, Alberta, Canada in December, 1975. Based on Poor Bear’s three affidavits, which changed each time, the FBI was able to extradite Peltier, though he fought extradition. The time it took to complete the extradition back to the U.S. cost Peltier more than his freedom. During that time, the federal government conducted the trials against Robideau and Butler in Cedar Rapids, Michigan. The government could not provide direct evidence that the two were the shooters. According to FBI documents, they could not locate their two main witnesses, both who would manage to be available for Peltier’s trial. Robideau and Butler were acquited. The FBI states that the shell casings fired from Coler and Williams’ guns and found in the vicinity of Butler’s home was inadmissible in the trial of Robideau and Butler. These same findings were allowed in Peltier’s trial. Robideau and Butler’s trial also differed from Peltier’s in that the jury was allowed to hear testimony of the activities of law enforcement around the reservation prior to the June 26 incident. Testimony was allowed to prove self defense for the defendants as the activities of law enforcement prior to the event created an atmosphere of fear and violence. No such testimony was allowed in Peltier’s trial. According to the FBI, the jury was not sequestered, no gag orders were placed on the defense and the local media negatively portrayed the FBI’s case. The Minneapolis Division of the FBI in its history of the Peltier case contends that these factors jeopardized their case. In the end, Robideau and Butler were acquitted and walked free. Peltier’s trial was much different. Peltier and his defense faced a very different set of conditions at his trial. First, he would face federal prosecution in Fargo, North Dakota. The FBI obtained pre-trial rulings to sequester the jury, place gag orders on the attorneys and in what would create very different proceedings, disallow any testimony or information unless it directly affected the witnesses or defendant in the case. It stripped the defense of the prior conditions evidence used in Robideau and Butler’s trial. The negative press from that trial also prompted the FBI and government prosecutors to manage their case very differently inside and outside the courtroom. The vast differences between the two trials created a divide between law enforcement and Peltier and his supporters for decades. The government used the witness testimony that was unavailable in the other trial and hedged its focus on casings from an AR-15 rifle that was admitted as the weapon Peltier used to shoot Coler and Williams. Peltier was convicted of two counts of first-degree murder after a five-week trial in 1977. He was sent to a federal penitentiary in California. The FBI states that Peltier was involved in an escape, convicted as a felon in possession of a firearm and sent to Leavenworth, a prison in Kansas. The escape conviction would be used to blunt any future hearings for parole. The case against Peltier painted him as a cold and violent man, yet the growing number of supporters see a very different man. For Bruce and his many supporters around the world, Peltier was targeted as an example to keep the status quo. With much of the government’s conduct in question before the incident and during the trial questioned by more and more people, Peltier’s case has risen to a level of justice that captures the hearts and energy of people from every level of society. Bruce, a founder of Friends of Peltier, along with members of the Native American Movement (AIM) commemorated the 34th Anniversary of the incident by canvassing for signatures on support letters for Peltier in Portland. Other groups did the same in cities across the U.S. and in the UK. Bruce said time was short and the letters had to the be sent to the Commission by June 30. She has worked on these issues before. Bruce was affiliated with the Leonard Peltier Defense Committee from 2001-2003 and has provided research, writing and media services to the Peltier defense team from 2003-206. She helped found the Friends of Peltier in 2007. The group’s efforts have been positive. From outside Portland’s Pioneer Courthouse, she and about a dozen other volunteers garnered over 230 letters of support. Bruce said there couldn’t be too many as they would be needed to show support and raise awareness for Peltier’s case in front of the Parole Commission. Peltier could only hope from his cell that their efforts will garner his release. The U.S. Parole Commission has scheduled a hearing for his case on July 28, 2009. After several weeks, the commission again ruled against Peltier and denied his request for release. The U.S. Parole Commission handles an assortment of jurisdictions that includes federal offenders prior to 1987, District of Columbia offenders prior and after 2000, the Uniform Code of Military Justice (USMJ) offenders, transfer treaty cases, and state probationers and parolees in the Federal Witness Protection Program. Currently, four individuals sit on the panel. President Barack Obama extended two terms this spring. Bruce was cautious about the latest hearing. “I don’t have too much confidence in the Parole Commission,” she said as she was gathering signatures. “But numbers count.” During the previous appeal for a hearing in 2003, a U.S. appeals court denied the request. But, the 19-page decision admonished the U.S. government’s handling of the case. Bruce is well-versed in campaigning for support. She has spearheaded an international outreach of supporters that she keeps in close contact through a blog, listserv and public events. “The most active groups are in the UK, France and Belgium,” said Bruce. “There’s also great support for Peltier in Russia and Palestine. You should see the pictures of the markings done on the wall supporting Peltier,” she added. Bruce referred to the photos posted by Peltier’s Belgium support group, KOLA and the International Peltier Forum (IPF). 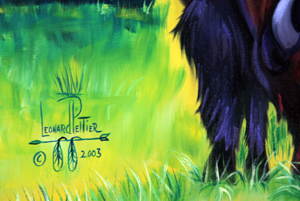 They feature several shots of the spray-painted message, “Leonard Peltier is Innocent. We demand Justice now!” on the section of Israel’s security wall outside Ramallah in June. The wall has become a message board for human rights’ taggers. Bruce said that one of the group’s greatest disappointments came at the end of the Clinton Administration. The momentum was building to have Peltier pardoned before President Clinton left office. Amnesty International, a human rights organization, issued a letter to request a pardon. Thousands of supporters, celebrities and groups joined in the request. But there was strong opposition to any pardon or hearing for Peltier. The FBI arranged for more than 500 agents and family members to stage a protest and pressure the White House during the last days of the administration. President Clinton would leave office without Peltier’s pardon. But, politics can lead to positive change. The campaign, No Parole Peltier Association, is most vocal in its opposition of Peltier’s release. They also conduct letter-writing campaigns and lobbying for their cause. The campaign website states that it is made up of people “with a personal connection to the vicious deaths of two FBI Special Agents...,” along with FBI agents and families. No direct contacts are available and the site hasn’t been updated since its launch in 2000. Friends of Peltier extend their efforts to other needs within the Native American community. It is a support system that reaches out to members of tribes throughout the U.S. With winter approaching, the organization highlighted the work of Pathways to the Spirit, a nonprofit organization in Colorado which raises money to pay for heating bills for destitute residents of Pine Ridge. Bruce, Peltier’s family and other organizations continue to keep Peltier's case alive with vigils and grass roots campaigns. “I learned a lot of things from my work on the Obama campaign,” said Bruce. She’s taking that knowledge to the street and cyberworld to build networks and sustainable campaigns. It’s a philosophy that works well in human rights. Some of Peltier’s supporters include Archbishop Desmond Tutu, Nelson Mandela, Ramsay Clark and Mary Robinson, along with dozens of celebrities, human rights organizations, churches, civic societies, scholars and individuals. UK designer Vivienne Westwood has featured “Free Peltier” campaigns in her Active Resistance collections for several years. David Geffen redirected his support from then-Presidential candidate Hillary Clinton to Barack Obama because of President Bill Clinton’s refusal to pardon Peltier. Bruce said the Portland community is also very active and receptive. The campaign for Peltier continues to grow. Peltier is also active in his defense. He paints and sells his works to raise funds. Some of his paintings are featured in Bonnie Kahn’s Wild West Gallery in Portland, Ore.
Bruce continues to work for Peltier’s pardon from President Obama. She is hinging her efforts on the President’s background in constitutional law, his race and statements during his presidential campaign. With sustained backing from her growing support networks, the hope of Peltier’s release is still alive. When Amnesty International first raised concerns over the conduct of the trial in the 1990s, the organization set precedence for his case. Amnesty continues to regard Peltier’s case as a human rights issue without drawing any conclusions on Peltier’s guilt or innocence. The most recent public acknowledgment of Peltier by Amnesty was in a 2006 briefing to the U.S. Congressional Human Rights Committee. For Bruce and Peltier's supporters, his case represents the human condition and justice. Their work continues to seek Peltier's release, even after the disappointment from the parole denial. Supporters are looking to Congress to bring Peltier's case to President Barack Obama's attention. They have also asked Attorney General Eric Holder to look into the case. The continuing push for Peltier is hedged on his deteriorating health. They are determined to make sure Peltier doesn't die in prison. Robideau, who was living in Spain as the director of an AIM museum died in February.